BRIGHTON, Mich.- Running your own business is no easy task. Add in managing a family too and there's just not enough time in the day! You're going non-stop form sun up to sun down with meetings, groceries, and after school activities. 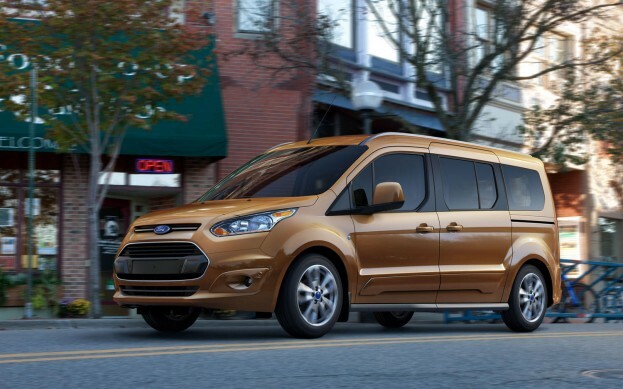 It's time to simplify the equation with the new 2014 Ford Transit Connect Wagon For Work & Play! Who has the time, or money, to worry about two vehicles when this fits into your life so easily? The design of the new 2014 Ford Transit Connect Wagon keeps space and style in mind so you can transition from work to play without even thinking about. With 77 cubic feet of customizable storage behind the front seats, the five-seat wagon fits it all. Exactly how much does it fit? You could fit four 180-gallon fish tanks, or 26 large suitcases, or 19 golf bags behind the front seats of the Ford Transit! So we're pretty confident you'll be able to fit all of your work and play needs inside. But for those of you who need more space, we've got you covered. Just opt for the long-wheelbase seven-passenger model which offers even more space, a total of 104 cubic feet of storage! With all that space you're probably wondering how much it's going to cost you at the pump. But don't worry, with the available 1.6-liter EcoBoost engine, the 2014 Transit Connect Wagon is fuel-efficient too! We're expecting the Transit Connect to arrive later this year, so stop by your Lake Fenton Area Ford Dealer to learn more. Whether Ford's Transit Connect is perfect for your work or play, we can help you out with our Auto Loans!